Brothers of Saint John of God | Irish Dioceses Participate in "24 Hours for the Lord"
Special opportunities will be available in dioceses for prayer and confession over today and tomorrow. 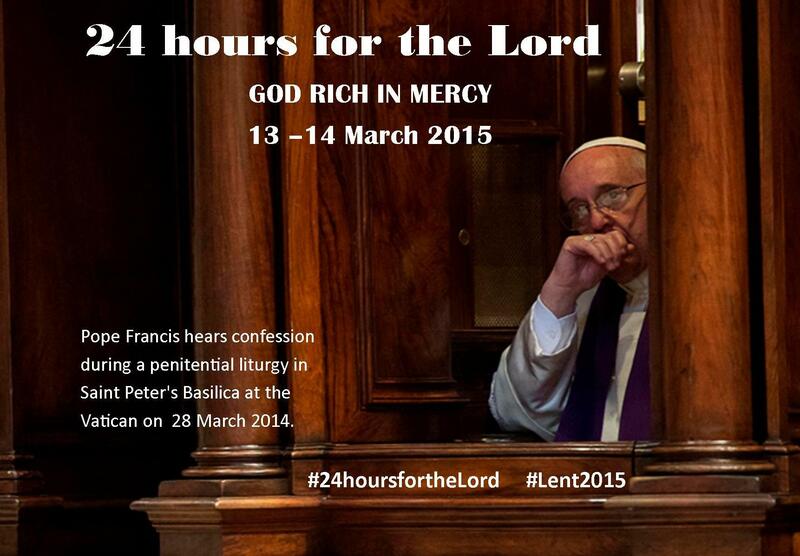 Irish dioceses will be taking part in the ‘24 hours for the Lord’ initiative today and tomorrow which encourages catholics to avail of the sacrament of confession during Lent. The initiative was received with great enthusiasm when it was introduced in 2014. The theme guiding this year’s reflection is ‘God rich in mercy’ (Eph 2:4). Special opportunities will be available in dioceses for prayer and confession and in Rome Pope Francis himself will be participating in the initiative and will preside at a penitential service in St Peter’s Basilica in order to place the Sacrament of Reconciliation at the centre of the Church’s mission of the new evangelisation. For priests, too, confession should be a learning experience, the Pope continued. He remarked that confessors, as witnesses to the repentance of others, can be led to examine their own consciences more carefully. “Every faithful penitent who approaches the confessional is ‘sacred ground’ to be cultivated with dedication, care and pastoral attention,” the Pope said. He stressed that priests, in hearing confessions, should always bear in mind that they are ministers “purely by the grace of God,” and it is God’s mercy that they invoke. Follow what’s happening in Irish dioceses on Twitter by using the #24hoursfortheLord hashtag and by following @CatholicBishops. – In the Archdiocese of Armagh, the 24 hours for the Lord initiative will take place in St Malachy’s Church, Armagh, beginning with Mass at 7pm on Friday 13 March and concluding with Mass at 7pm on Saturday 14 March. During the 24 hours, there will be special times of prayer and reflection. Cardinal Seán Brady, Archbishop Emeritus of Armagh, will celebrate Mass on the Friday evening and the 24 hours will conclude with the Saturday evening Mass being celebrated by Archbishop Eamon Martin, Archbishop of Armagh and Primate of All Ireland. Friday 13 March: Mass at 7pm. Night prayer at 10pm. 12 midnight Rosary. Saturday 14 March: Reflections and Prayers at 6am. Morning Prayer at 9am. Midday Prayer 12 noon. Way of the Cross at 3pm. Evening Prayer at 5pm. Sunday Vigil Mass at 7pm. Midleton Deanery: Saint Colman’s Cathedral, Cobh. Fermoy Deanery: Saint Patrick’s Church, Fermoy. Priests from neighbouring parishes will take part in a rota of confessors to ensure that at least one priest is available right through the 24 hour period for the Sacrament of Reconciliation. Eucharistic Adoration will also take place in the above churches over the 24 hour period. Everyone is welcome to come to those churches either to pray and/or avail of the Sacrament of Reconciliation during that 24 hour period. – The Diocese of Derry is inviting people to gather in prayer in the presence of the Blessed Sacrament in Saint Mary’s Oratory, Buncrana, beginning at 5.30pm on Friday 13 March and concluding at 5.30pm on Saturday 14 March. The Sacrament of Reconciliation will be available on Friday 13 March from 8.00pm – 11.00pm and on Saturday 14 March from 11.00am until 5.00pm. For more information contact Buncrana Parish on 074 9361253 or visit www.buncranaparish.com. – Three parishes, one from each deanery in the Diocese of Kildare and Leighlin, will host 24 Hours for the Lord, and Bishop Denis Nulty will attend each parish at various times during the 24 hours. The Cathedral Parish in Carlow will host adoration from 6pm on Friday 13 March, ending with the 6.15pm Mass on Saturday 14 March. The 24 hours initiative will begin in Saint Michael’s Church in Portarlington on Friday 13 March and will end with the 6.15pm Mass on Saturday 14 March. In Ballycane Church in Naas, Co Kildare, the 24 hours initiative will begin at 8pm on Friday 13 March and will end with the 7.30pm Mass on Saturday 14 March. – Elsewhere, in the Diocese of Elphin 24 hours for the Lord initiative will be observed in Sligo, Roscommon Town and Athlone. In the Cathedral of the Immaculate Conception, Sligo, a Holy Hour on the theme of reconciliation will be held on Friday 13 March from 6pm-7pm. Following this Holy Hour, adoration of the Blessed Sacrament will continue in the Adoration Chapel until Saturday 14 March concluding with vigil Mass at 7.30pm in the Cathedral. The theme which will guide this prayer vigil is: ‘God rich in mercy’ (Eph 2:4). In the Church of the Sacred Heart, Roscommon Town, there will be Exposition of the Blessed Sacrament and Prayer on Friday 13 March from 7.30pm until Midnight with an opportunity for the Sacrament of Penance during this time. On Saturday 14 March there will opportunity for the Sacrament of Reconciliation from 11-12 noon; from 2-3pm and at 7.30pm. In the Church of Our Lady of Lourdes, Caltra, there will be Mass on Friday 13 March at 7pm, followed by Stations of the Cross at 7.30 pm, leading to all-night Adoration, ending with Mass on Saturday evening. There will be an opportunity for those present to avail of the Sacrament of Reconciliation on Friday from 8 to 9pm, and on Saturday from 11am to 12pm and from 6 to 7pm. In Athlone, Co Westmeath, the Disciples of the Divine Master welcome you to join them in the Chapel of Adoration for a guided prayer vigil from 9pm to 10 pm on Friday 13 March. – In the Diocese of Kerry, the Tralee Pastoral Area will celebrate 24 Hours For The Lord in Saint John’s Church on Friday 13 March from 6.45pm until the Saturday evening vigil Mass at 6.10pm. Saint John’s Church will be open for Eucharistic Adoration and the Sacrament of Reconciliation throughout these 24 hours. The parish invites you to drop in and spend some time with the Lord. – In the Diocese of Limerick the 24 hours for the Lord initiative will take place in Saint Augustine’s Church, O’Connell Street, Limerick. It will begin on Friday 13 March after the 4pm Mass and will conclude on Saturday 14 March after Mass for the Sick which begins at 3pm. In between the various liturgies there will be Eucharistic Adoration with priests available for the Sacrament of Reconciliation. All are welcome. Confession helps people feel shame for the wrong they have done and embraces them with God’s love so that they know they are forgiven and can go out strengthened in the battle to avoid sin in the future. The confessional is not a dry cleaners, a business of sorts that’s just washes out the stain of sin, the pope said to members of the Vatican’s investment agency on April 29. “I can’t be baptized two or three or four times, but I can go to confession, and when I go to confession, I renew that grace of baptism,” the pope said at his general audience on 13 November 2013. It’s not a torture chamber where you’ll be raked over the coals. It’s not a psychiatric session that neglects the question of sin or a mental email to God that avoids the face-to-face encounter with the Lord through the priest. The sincere and humble admission of one’s weaknesses, of having “a sliver of Satan in my flesh,” shows that the power of salvation comes from God, not oneself,” Pope Francis said in a morning homily on 14 June 2013. Confession “is going to praise God, because I — the sinner — have been saved by him,” who always waits and always forgives “with tenderness.